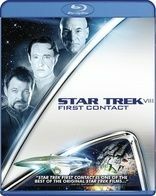 If you’re a fan of the original Star Trek movies but don’t want to buy the boxsets featuring all of the original Star Trek cast movies or the Next Generation cast movies, then Best Buy as a great deal for you. For the month of May, Best Buy is offering the single title movies for $9.99 each. Now, not every movie is available as Paramount has only released individually the most popular of the two generations of Star Trek movies. In the William Shatner and Leonard Nimoy era of films, you have your choices of Star Trek II: The Wrath Of Khan, Star Trek IV: The Voyage Home, and “Star Trek VI: The Undiscovered County (essentially the even numbered movies). In the Patrick Stewart and Jonathan Frakes era of films, the only one available is Star Trek: First Contact. These are considered the best four movies of the first 10 Star Trek movies and in my book are the must own ones. Take advantage of the tremendous savings and get each for $9.99. To get them, just click on the titles of the movie here and you’ll be taken to a page on Best Buy.com where you can purchase them. Unfortunately, the Blu-Ray for the 2009 J.J. Abrams Star Trek movie isn’t included in the $9.99 sale, but it is on special for $19.99. Click here to get it. Be sure to take advantage of in-store pickup if there is a Best Buy near you. The sale price only lasts until the end of May.